Anti-Pitchfork: A Tribe Called Quest didn't reunite at Santos! A Tribe Called Quest didn't reunite at Santos! A Tribe Called Quest reissued their 1990 debut People's Instinctive Travels and the Paths of Rhythm for its 25th anniversary last week (it got a 10 on Pitchfork) and they held two celebrations for that over the weekend. First, they reunited on The Tonight Show Starring Jimmy Fallon like they said they would. Then the next night was their release party at Santos in Manhattan. 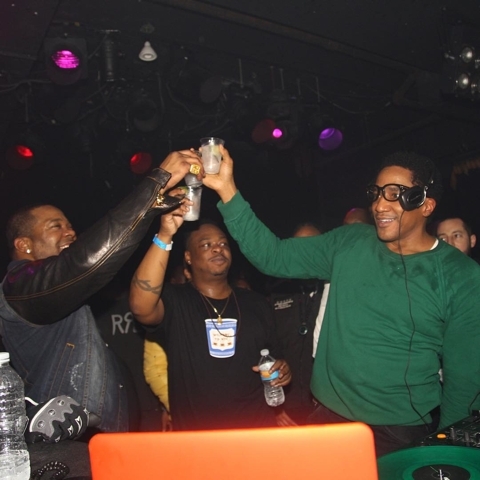 It was billed as having DJ sets by Q-Tip and Ali Shaheed Muhammad with appearances by Phife and Jarobi, which got people wondering if they'd perform together there too, but no such luck. It was packed and looked like a total party though. Labels: A Tribe Called Quest didn't reunite at Santos! They reunited as people, which isn't new. But they didn't perform a set. I was there and it was lame.